The parliament of Uganda has taken a first step towards scrapping the presidential age limit, which would allow long-time leader Yoweri Museveni to stay in power, in a heated session that saw politicians brawling for a second consecutive day. Tempers frayed in parliament for the second day over the plan, backed by members of Museveni’s National Resistance Movement (NRM) party. 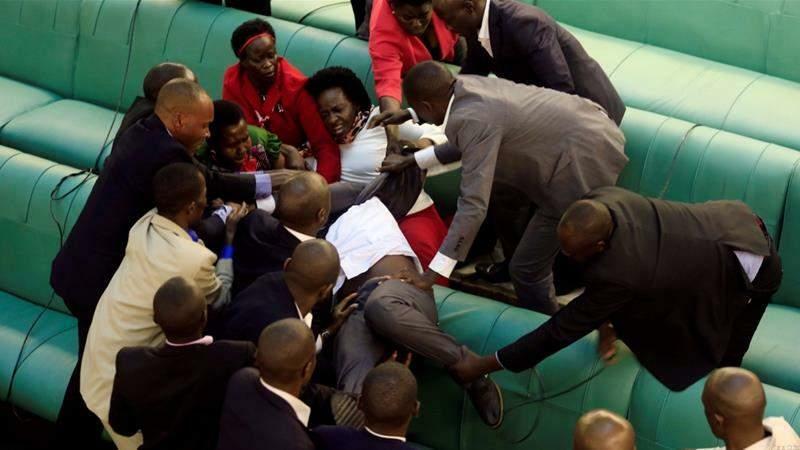 MPs brandished microphone stands, threw punches and clambered over benches as security officers sought to remove 25 legislators barred by Speaker Rebecca Kadaga after engaging in another brawl on the same issue on Tuesday. Despite the disruption, the bill was passed after the leader of the parliamentary opposition, Winnie Kiiza of the Forum for Democratic Change (FDC), led a walk-out. “We are not going to be part of Museveni’s life presidency project,” Kiiza said.Under the existing constitution, a person standing for president must be under 75 years of age – which would make Museveni, 73, ineligible to stand in the next polls in 2021.